Are Flagships Worth the Price for Outsiders? I received an email recently from a mom who was upset because her smart daughter didn’t receive any scholarships from the schools on her list. All the school were prestigious public flagships outside her state. These institutions will be among the toughest to receive meaningful scholarships from because they are most demand from their own state residents and they can also attract applications from students across the country. It’s a classic supply-and-demand situation. Schools that don’t have to offer much of a financial enticement to attract students to their campuses usually won’t. Elite flagships are recruiting high-income students. 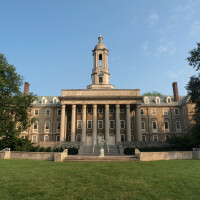 When students contemplate the possibility of attending college outside their own state, they often put prominent state flagships on their dream lists. A major reason for this is because the typical teenagers and their parents know of very few colleges and universities. If you aren’t rich, however, I’d suggest that you not immediately fall in love with flagships that enjoy brand names like the Universities of California, Michigan and Texas or that are located in desirable geographic areas such as the Universities of Colorado and University of Vermont (near mountains) and the University of Arizona and Arizona State (temperate weather). These schools and others with strong brand names are hungry for outsiders who can bankroll an education that can cost more than $200,000. Some of these schools, such as Michigan, provide token merit scholarships – $4,938 is the average – but that won’t go far when you will be paying private school prices for state educations. Some flagships, such as the University of Wisconsin and University of California campuses, don’t give merit scholarships to outsiders. Popular state flagships are charging high prices because they can. Plenty of wealthy families are willing to pay the tab for these schools because of their cache. 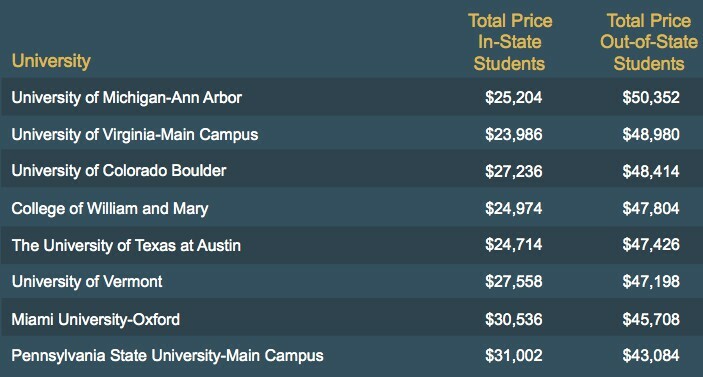 To illustrate what I’m talking about, below you’ll find a list of the most expensive state schools for nonresidents. 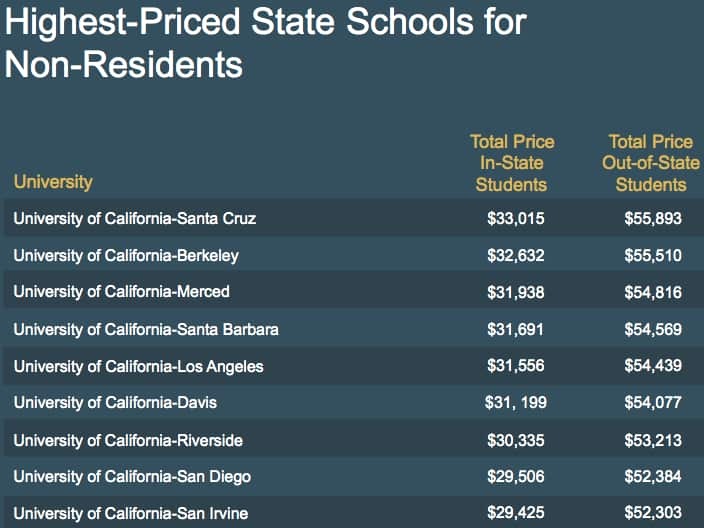 As you’ll notice when you look at the list above, the most expensive schools for nonresidents are the nine undergraduate campuses of the University of California. 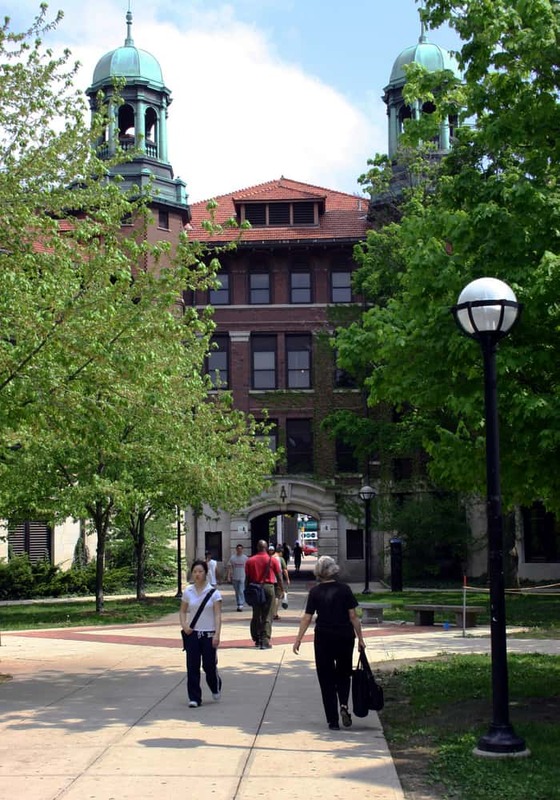 An insider told me that before the UC system started its aggressive push to attract nonresidents, the administrators decided to price their schools higher than the University of Michigan, which used to be the most expensive state school for outsiders. According to federal statistics, below you’ll find the next most expensive state schools for nonresidents. Nearly all the names on this list shouldn’t be surprising. It’s easier to gain admission into prestigious flagships as an outsider now because these institutions need the extra cash. Finding out-of-state sugar daddies is one way for these schools to attract new dollars. And it’s easier to entice rich students to their campuses than for these institutions to get serious about making meaningful structural changes. I wrote a story for my college blog over at CBS MoneyWatch a few years ago about a dad, who works at Columbia University, whose daughter had planned to attend the University of Michigan. She attended the new student orientation in the summer before her dad noticed that he had misread the bill. He thought the tuition was going to be a total of $19,000, but that was the price per semester. Affluent students are the ones attending these schools because states schools, with some exceptions, give little or no need-based aid to nonresident applicants who can’t afford the tab. As these flagships attract more higher-income students within their own borders and beyond, low and middle-income residents are getting less access to these institutions. In essence, these mighty institutions are becoming privatized. 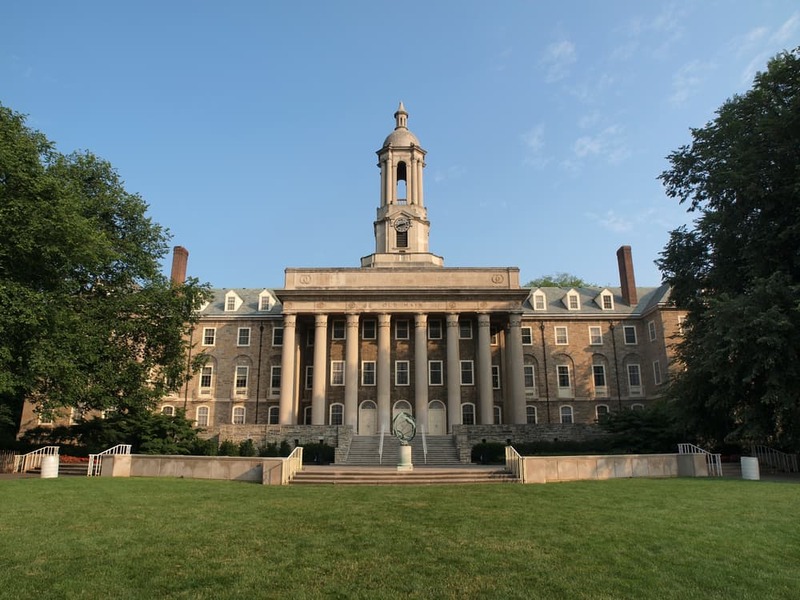 Unfortunately, some students heading to these flagships can’t afford the added out-of-state cost and will face scary debt loads just to earn a diploma from a school with a marquee name. 4 Responses to Are Flagships Worth the Price for Outsiders? I think you do need to be careful when evaluating costs. However, my daughter attends UW Madison from out of state and did receive a merit based scholarship(they give very few) and with room and board the total cost her freshman year was 27,000. Congratulations Alison! I should note here that the vast majority of nonresidents will pay full price at U. of Wisconsin. Among these schools Miami of Ohio goes pretty far down into a freshman class with merit-based aid. An out-of-state student who might fall into the middle of the pack at Michigan could receive a half or full-tuition award from Miami. Miami does have to give merit aid because many students haven’t heard of this school. The average amount though is not high – roughly $6,800.